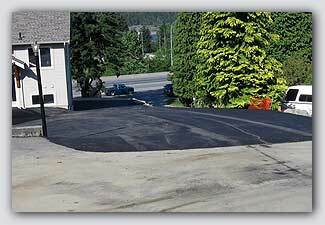 Mid-Island Paving offers you the advantages of asphalt paving at realistic prices. Our paved driveways are constructed for durability, minimum maintenance, and aesthetics. But no two jobs are exactly alike. Every individual terrain, soil, or aesthetic situation requires a unique solution. We identify these specific needs and provide you with a driveway that will be both low maintenance, as well as complementary to your home and surrounding landscape. 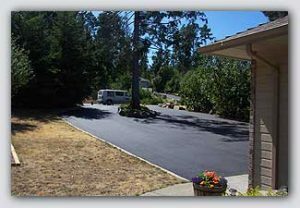 Mid-Island Paving’s asphalt driveways provide the right flexibility to best deal with the abuse of BC’s summer heat and winter rain. With a Mid-Island Paving driveway, normal maintenance is made easier. Not Just A Driveway. A Part Of Your Landscape! Each Mid-Island Paving driveway has its own special design – one that fits your surrounding landscape, as well as your budget. 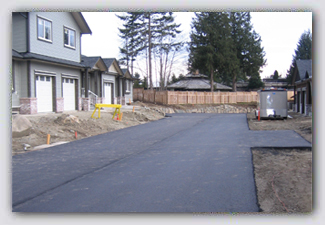 Our experienced estimators work with you to plan the exact driveway you envision. And our skilled asphalt technicians have the experience and equipment necessary to make your plan a reality.